Party Balloons are not just for parties anymore. Bright colored, Colorful balloons are a complete fun to decorate the stage. Balloons really give a cost-effective solution to the organizers and to the part host as well. There are so many ways that balloons can be used for the kid’s party. If you are giving the party invitation personally then you can inflate the balloons and write the details of the party over the inflated balloon and give it to your distinguished guest. You can also take the party invitation print-out and paste it over the inflated balloons to give it to your distinguished guests. You can also insert the party invitation inside the balloon and give it to your guests. Then ask your guests to inflate the balloon and read your invite in a unique way. You can inflate the balloon; write your party invitation over it. Then deflate the balloon and ask your guests to inflate the balloons to read the written party invitation. Fill helium-gas inside the balloon and tie it to the end of the string and let it hang with the celling of the party area. You can decorate the center table using balloons by adding different shapes to the balloons. Create a nice backdrop at the center stage and give your guests an ultimate place for the photo shoot. Inflate balloons to form a colorful arch. Place this arch at the entrance area to provide a warm welcome to your distinguished guests. 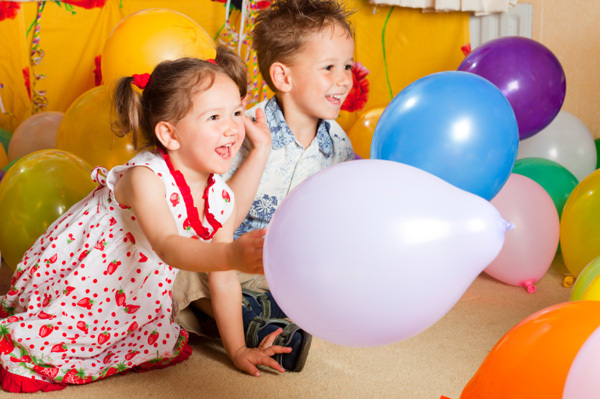 Involve kids in different Balloon Activities – Give some games to the kids and let them enjoy the party to the fullest. Invite all kids at the party and give them some time to paint the balloons. Kids doing the best painting over the balloon would be the winner of the game. You can conduct the balloon games for kids and invite all the participants to give the one-minutes time to inflate as many balloons as each one can. The winner would be the one who inflates more number of balloons in one-minute time. The only thing that we come across and cannot be done with the help of balloons is the baby food using balloons. But there are so many ways that we can always use to decorate the food and include balloon decoration even in food. Kids always love to get surprises. Do not forget to plan the return gift for the kids. You can inflate some colorful balloons and hang them over the return gift with the tag of the person whomsoever that particular gift belongs to. There are so many ways that balloons can add glamor to your otherwise boring party. All you need to do is to inflate as many balloons as you can.